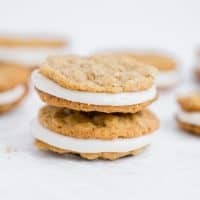 Homemade oatmeal cream cookies -chewy oatmeal cookies filled with a marshmallow cream frosting. Preheat the oven to 350°F and line baking sheets with parchment paper. Set aside. Combine the butter, brown sugar and granulated sugar in a large mixing bowl. Beat on medium speed until creamy. Add in the egg and vanilla and beat until free of lumps. In a separate bowl, combine the flour, baking soda, baking powder, salt. cinnamon and nutmeg. Mix well. Gradually add to the butter mixture and mix just until combined. Stir in the oats until combined. Using a small cookie scoop or Tablespoon, drop cookies onto the baking sheet 2-inches apart. Bake in the preheated oven for 7-8 minutes, or until lightly golden around the edges, while the center is still slightly soft. Remove from oven and allow to cool on the pan for a couple minutes. Transfer the cookies to a cooling rack. Allow to cool completely. If making cookie sandwiches, use a small cookie scoop or roll into an inch ball. If serving the cookies frosted with one cookies, I prefer to use a medium cookie scoop.